Easter is here. Hurrah. A time of long weekends, chocolate and the Sunday Roast. However if you find yourself a little too old for Easter hunts, fluffy bunnies and chicks, then I have the perfect saviour. Easter Cocktails. Some of these have enough alcohol to make the Easter Bunny's tail curl. Enjoy. You know Easter is worth celebrating when even Gordon Ramsey is feeling the fun, chocolaty love. 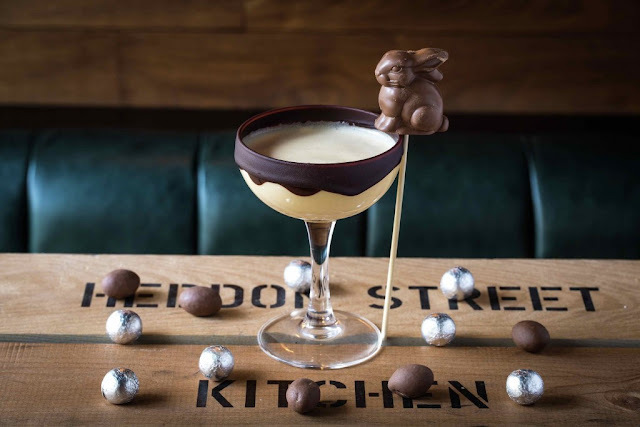 His West End casual restaurant have launched a rather decadent sounding Honey Bunny cocktail. Made from Bacardi Carta Blanca, Mozart White chocolate liqueur, orange curacao, chocolate bitters, egg yolk, and a chocolate orange rim, it's got all the ingredients for a very adult Easter. But don't forget the little chocolate bunny too. I mean we had to have some tradition right? MASH, standing for Modern American Steak House (not a pie and mash shop as I once thought) have devised a chocolate take on a traditional flip. Through in some orange bitters for extra Easter effect and you've got yourself a Flip the Bunny. Made from Maker’s Mark, Pedro Ximenez Sherry, Orange Curacao and Chocolate bitters, it might leave you doing flips by the end of the night. It was only a matter of time before Creme Eggs came into action. The Crème Egg Mojito pretty much runs with the idea of combining two of Britan's most loved things. Creme Eggs and alcohol. Boozy chocolate? What's not to love? 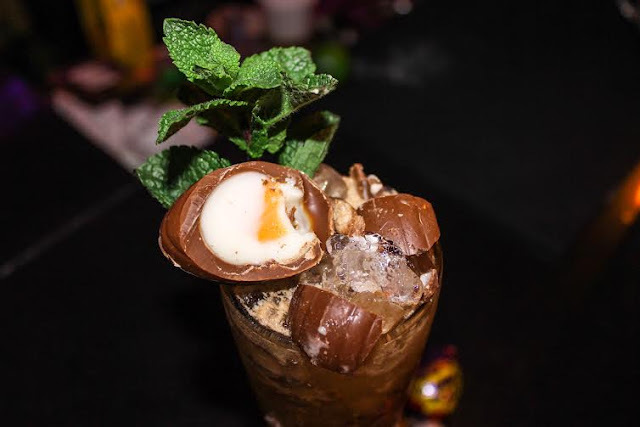 The indulgent Crème Egg mojito is a blend of rum and chocolate liqueur with the smashed-up Creme Egg. The only thing that can't be guaranteed is the original Dairy Milk Creme Egg. Damn you Kraft! Do you remember Easter egg hunts as a kid? Weren't they just awesome? 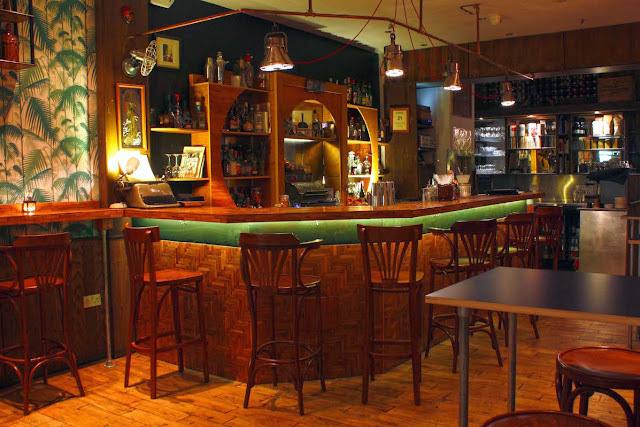 Well how about reliving that but with a egg hunt is for over 18’s only… Victory Mansion in Stoke Newington are hosting a 'bunny-hop' -Bar Craw- Bunny Hop- you get it?- from bar to bar down the street collecting eggs that can be swapped at other bars throughout the night. Those bars include a personal favorite, Original Sin, but also Fontains, Ruby’s, High Water & Pond. Don't worry though, for those who feel it might be too much effort, there will even be a rickshaw on hand to ferry punters from bar to bar! Also each bar will have an Easter themed item and selfies are very much encouraged. If you post 6 selfies you win a special Easter prize. My guess it's chocolate booze related. Or even better, if they could source an original Dairy Milk Creme Egg... I need to let this go, don't I? 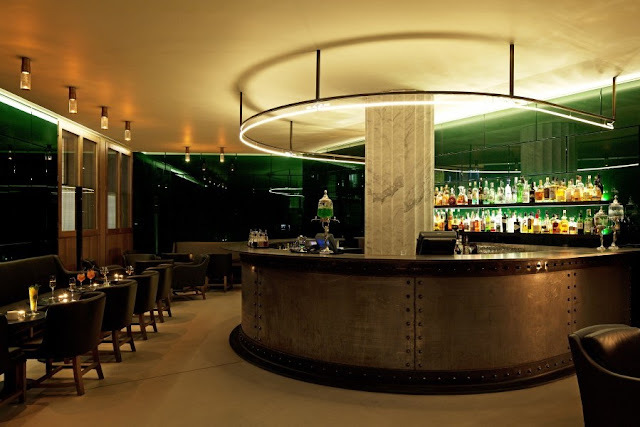 The Green Bar is a frankly underused bar in Piccadilly. It's haven away from the hustle and bustle of shoppers. But now they have another reason for me to love them. A Vodka Chocolate Martini this Easter. This is for the more classy Easter drinkers as its made from Belvedere Unfiltered, infused with essence of orange and cocoa and an infusion with maple wood chipping smoke. Oh and if you do get hungry, pop into their Cafe next for the most amazing Easter cakes. 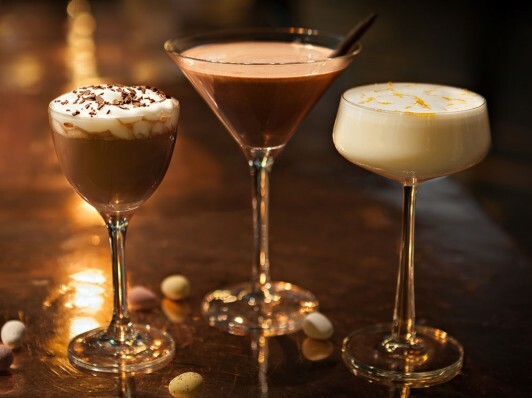 For those craving a slightly more grown-up way to indulge in Easter eggs, the guys down at Dirty Martini have created some special, limited edition, Easter Choctails. There are three to choose from... or you know, have all three. Slightly more creative than the chocolate orange of other bars, there is the Maltease, a rich and creamy cocktail which pairs Havana 3yr Rum with Mozart White Chocolate Vanilla Cream, Coconut Water, Maple Syrup, Nutella and Ovaltine to create the malt-chocolate flavour of a certain branded chocolate you love. The decadent White Rabbit teams Solerno Blood Orange, Morgan’s Spiced Rum, Crème de Cacao, Caramel Syrup, Mascarpone and Mozart Dark Chocolate Bitters – making this more dessert than drink. Finally there had to be a Chocolate Martini didn't there? Combining Absolut Vanilla Vodka, Briottet Crème de Cacao and Frangelico with Double Cream and Chocolate Powder, it's a more decadent version of others around. Ok, so Easter we tend to think of Chocolate, but what else is there? Lamb? Yeah maybe not in a drink... No, I'm thinking Hot Cross Buns! 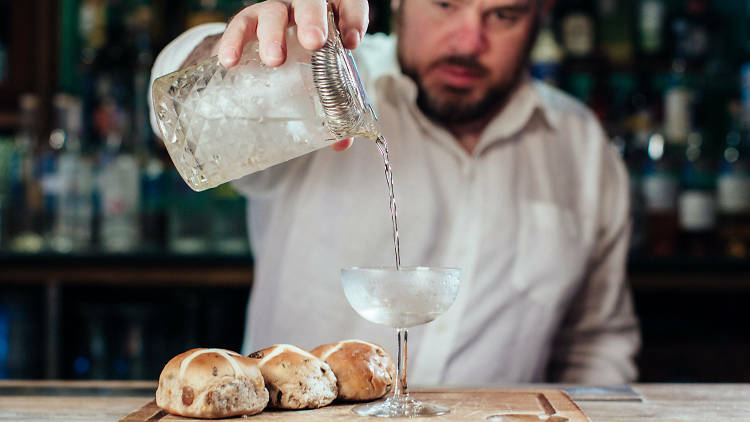 Portobello Road Gin have made the ‘Not Cross Bun Gin Martini’, by distilling high-strength alcohol with hot cross buns. What could be better? Add in a little raisin-infused dry vermouth and a lemon cross and you get this Easter worthy cocktail.